Erlandsen made hand tools that became an industry standard in three areas: bow drills, infill planes, and tuning hammers. I’ll start with the tuning hammers. 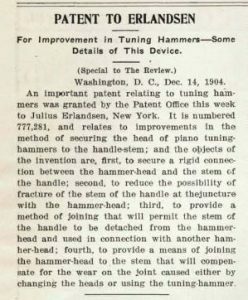 Charles Mueller 1899 patented extension tuning hammer, made by Julius Erlandsen. Picture was taken after using it to tune for a performance. 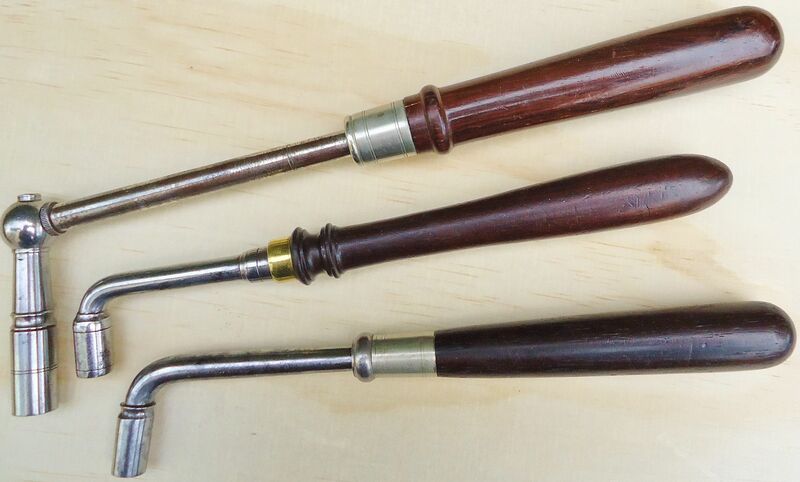 I have used many of the Erlandsen hammers professionally as well as the Mueller hammers (Erlandsen made), and have found that they work especially well on pianos made from 1880 to 1940 that are still in original condition. This is because the Erlandsen socket is machined very well to fit the tuning pins of pianos that were new at the time: <.276” to .282”. 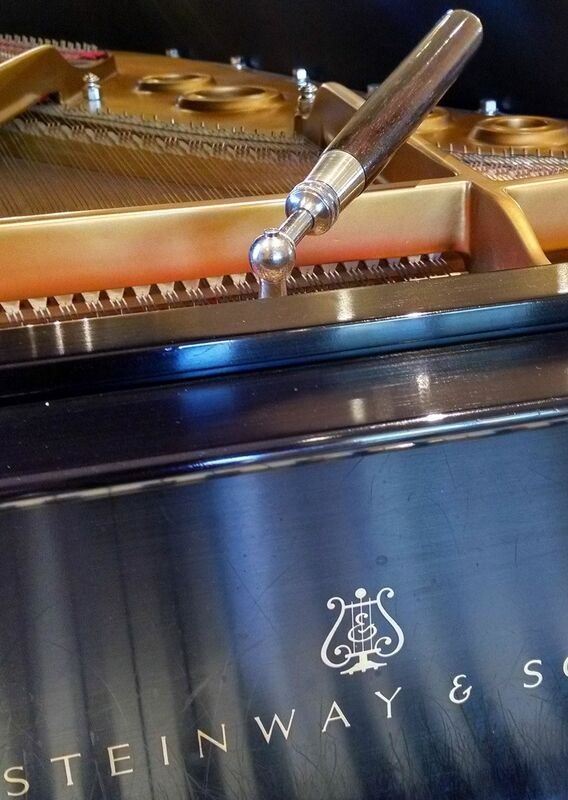 Erlandsen hammers also work well on many fine European pianos, such as Bechstein or Bosendorfer, and some domestic postwar pianos like Steinway up to the early 1960s. They also work well on some Japanese pianos, like Yamaha and Kawai, before 1990 or so. 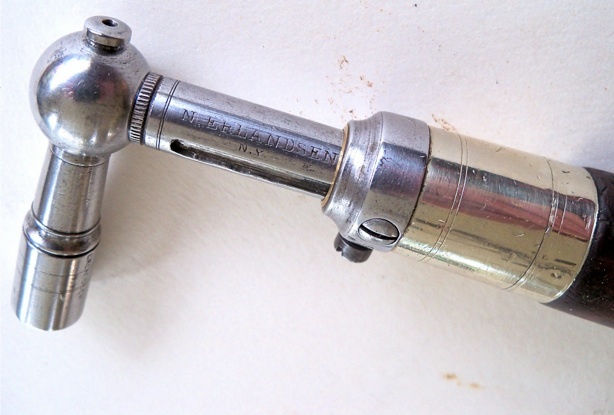 Erlandsen never adopted the interchangeable tuning tip featured by their main competitor, Hale, but they did offer many different heads of varying lengths, and there is some variation in the how their star socket was machined over the years. Perhaps some of this variation was a result of special orders made to the Erlandsen machine shop. Because of this, a limited number of Erlandsen heads can accommodate 3.0 tuning pins. 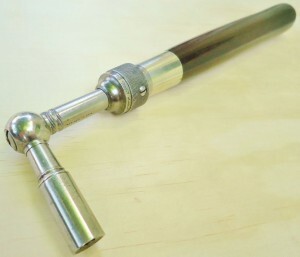 The two set screws on the collar, one for rotational stability and the other for longitudinal stability made the fixture of the adjustable shaft rock solid, and given that the tuner typically carried several screwdrivers, the need for this separate tool for adjustment was not a detriment. 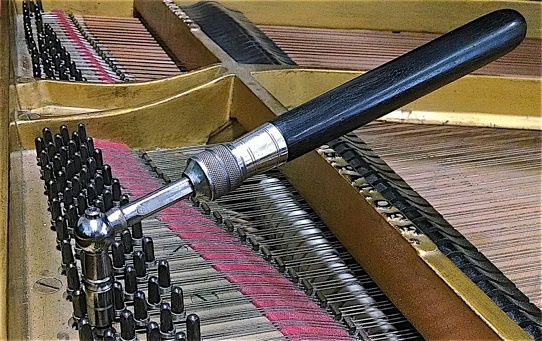 The tuning pins of these pianos have less torque, or tightness in the pinblock than new pianos, either by manufacturer’s intent, for the older ones (1860-1890), and/or through aging and seasoning. In Northern California, however, where I ply my trade, many of these vintage pianos still have surprisingly tight tuning pins as compared to those in the East Coast or Midwest which are subject to cycles of forced air heating in the winter and high humidity in the summer. 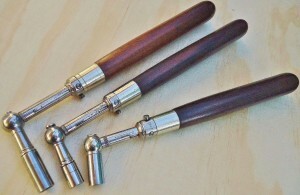 The slightly lower tuning pin torque in these vintage instruments lessons the amount of flexing of the adjustable shaft on the Erlandsen hammer. The Erlandsen shaft is somewhat narrower at ~13/32″, as compared to 7/16″ and larger for modern shafts, although the quality of the steel in the Erlandsen shafts is better in my opinion, despite all of the advances in metallurgy over the intervening years. Dealing with the flexing of tuning pins was and is an inherent part of the tuner’s job, and until the recent introduction of carbon fiber tuning hammers, dealing with some flex in the tuning hammer was also part of this task. Erlandsen tuning hammers are not particularly useful on pins larger than 2.0 because of the relatively small size of their tuning pin socket. During the period in which the Erlandsens were active, 1863 to 1940, the piano restoration business, which would typically restring with larger tuning pins, was relatively small because the majority of pianos in the U.S. were not yet old enough to require that procedure. 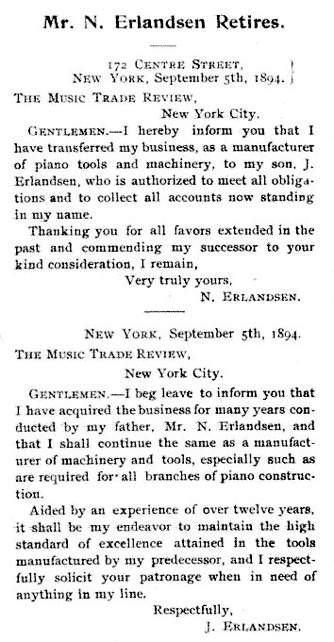 Napoleon Erlandsen, a Danish immigrant (1831-1900), moved to New York, and began making tools for the piano trade around 1863. Napoleon was a skilled machinist, designer and woodworker, and he developed a tool making business that supplied Hammacher Schlemmer, Alfred Dolge, American Felt Co., and Schley, as well as other piano tool and supply retailers. He developed a full line of tools for tuners, action regulators, case makers, bellymen, and other allied tradesmen. His son, Julius (1866-1956), joined him in the early 1880s, and they worked together until about 1894, when Napoleon retired. Napoleon was severely injured in a streetcar accident and died as a result of his injuries in 1900. Julius continued the business until at least 1940, according to the US federal census. Napoleon handed his business down to his son, Julius. 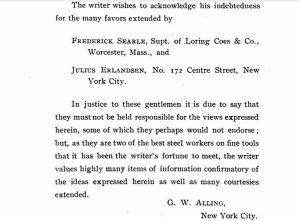 1894 article in the “Music Trades Review.” This revealed that Julius Erlandsen was in now control of the company, innovating, and receiving credit for it. 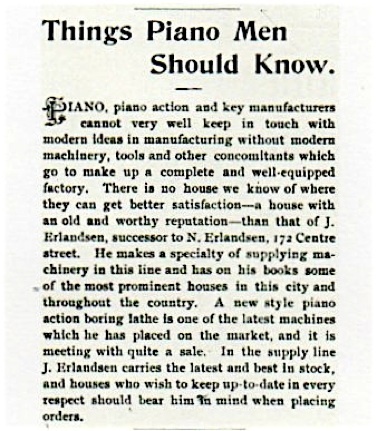 Its just one example of the wide range of products that the Erlandsen machine shop supplied for the piano industry. Julius Erlandsen was a graduate of Cooper Union, free night school. 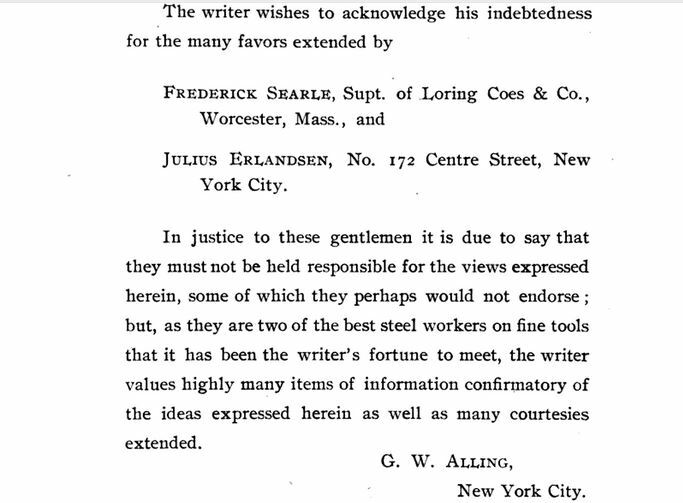 Acknowledgements from “Points for Buyers and Users of Tool Steel,” by George W. Alling. 1903. Julius Erlandsen became a recognized expert in tool steel. I can say from experience that the steel and other metals used generally in Erlandsen products is superior to many others, then and now. 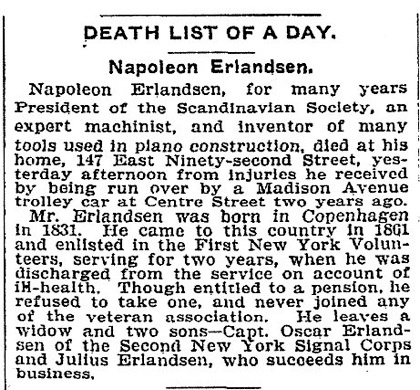 Obituary of Napoleon Erlandsen. Oscar Erlandsen, who sometimes served as a witness for Julius’ patents, went on to become a well known civil engineer. Erlandsen machine shop addresses: 519 East 5th St (1864-1865); 417 5th St (1865-1869–shared with mentor Lauritz Brandt); 615 East 5th St. (1868-1875–also shared with Lauritz Brandt); 87 Elizabeth St (1875-1880); 107 Rivington St. (1880-1893); 172 Center St. (1893-1931); 93 84th St. Jackson Heights, Long Island City, residence and work (1932~1940). Annual Report of the Factory Inspectors of the State of New York …, Issue 11. 1897. Julius Erlandsen had 5 employees, not counting himself. 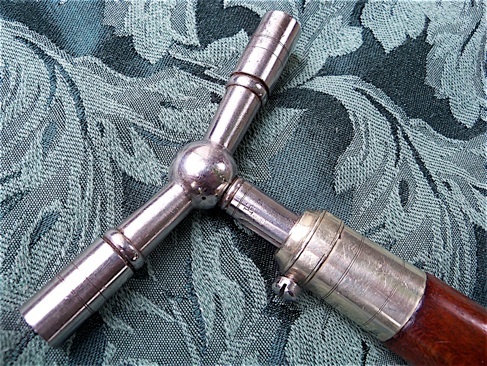 This is an earlier version of the Erlandsen hammer, with only one adjustment set screw (later models had two), with a German silver collar and ferrule, detailing on the metal parts, and a different turning design than later versions, for the double square head (two square sockets). Star tips may have been uncommon when this hammer was made. N. Erlandsen tuning hammer, early version. Two stationary Erlandsen hammers. At the back is the standard model which was offered in 1885, continued in production, and shown in catalogs as late as the 1930s. In the front is a small gooseneck tuning lever, very well made and probably produced early in Napoleon Erlandsen’s working life, c.1860s. Inside the rosewood handle, it has a steel shaft sheathed in a brass tube, with a detailed German silver ferrule and steel collar. This is much like the construction of Erlandsen’s extension hammers. It is a similar size to the antique French hammer (early 1800s) which is shown in the middle. Erlandsen hammer, single set screw, steel collar. This handle has been slightly flattened on each side by the user, to provide a better grip for flipping the tool over, in order to use the opposing socket of a double head attachment. 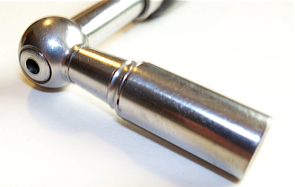 Before 1892: 1 large set screw with concave groove in the shaft. 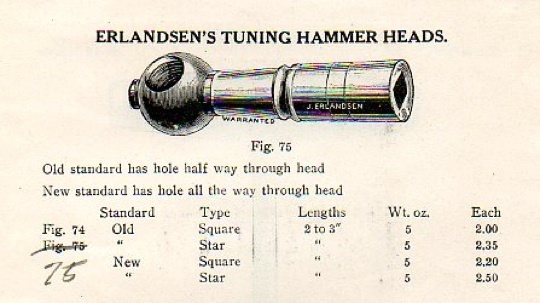 Erlandsen’s was one of the most secure single screw set type tuning hammers made. There is no rotation of the shaft within the hammer during use–even when extended. Erlandsen fitted his steel shafts snugly within the internal brass tube, almost like a piston. He also mated the end of the set screw to the bottom of the routed slot in the shaft. In order to organize this hand finishing, both Napoleon and Julius used fitting numbers, in this case, 18. Post 1892: N. Erlandsen, with two set screws, and flat groove in shaft. A. Dolge extension hammer, post-1892; after close examination, its almost certainly made by Erlandsen. 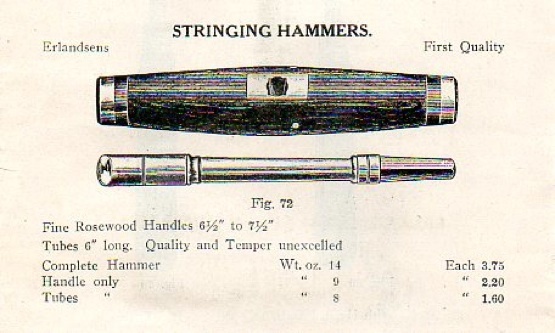 Alfred Dolge extension hammer, attributed to Erlandsen, as shown in the Dolge 1869-1892 pianomakers supply catalogue. Later American Felt extension tuning hammer c. 1899-1915, almost certainly made for them by Julius Erlandsen. Its an older design, and somewhat anachronistic, with brass ferrule and single set screw. It is a solid first quality hammer, however. The first one is virtually identical to the one illustrated above, featuring two screws, one for longitudinal stability and the other for rotational stability. It is a little heavier than the earliest Erlandsen levers, with a steel collar, a tube inside the handle, and a German silver ferrule. Julius used flat sheets of German silver, which he rolled and seamed together very tightly, in comparison with Napoleon, who used tapered cylinders. This is a very secure, usable tuning hammer, and is first quality in every respect. It was considered the standard up to the turn of the 20th century, and was still prominently featured in the catalogs through World War I, and into the 1920s. Middle hammer is dated 1902, with an earlier head from the N. Erlandsen era, and has very minor cosmetic differences from the previous one. Erlandsen was always tweaking their hardware, sometimes for functionality, and other times for cosmetics only. All three hammers have different steel collars. 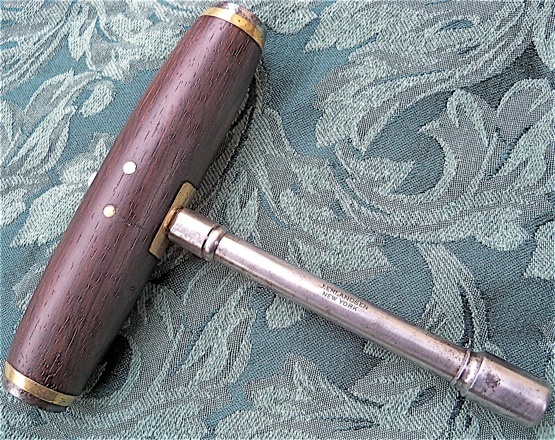 A later version is shown on the right, and it has a thread on the shaft that is compatible with pre-1925 Hale heads. 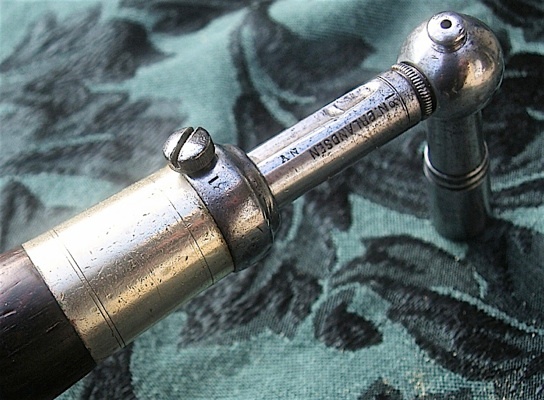 Hale made the short pre-1925 head with attached #3 tuning tip, shown at the bottom right. Erlandsen was likely feeling the competition from Hale when this hammer was made, circa 1920 to 1925. 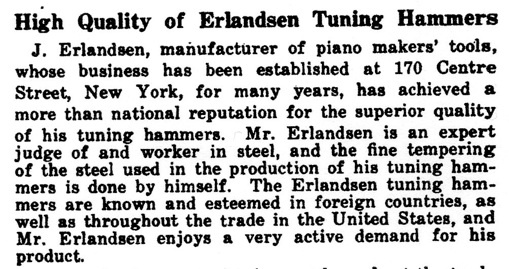 Incidentally, Erlandsen wasn’t the only piano tool maker not to adopt the separate tuning tip. Traditional Renner tuning hammers from Stuttgart, Germany (as opposed to the Renner USA products) did not offer separate tips either. Some Erlandsen tool products were carried by Otto Higel, in Toronto, Canada and J.& J. Goddard in London, England. 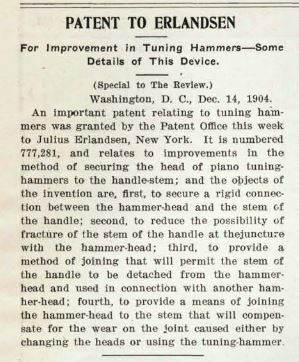 An example of the Erlandsen new standard tuning hammer head with hole through head, US patent, 13 Dec., 1904. This is the “tapered shoulder” design referred to in the 1905 catalog entry above. 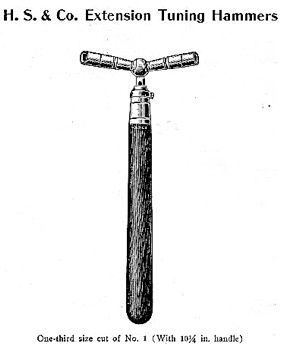 The Dec, 13 patent, again, was for the tapered shaft end that screws into a head bored completely through. This was done in an effort to eliminate breakage at the critical head/shaft connection. The Sept. 27, 1904 patent was for a loose sleeve (the knurled nut which usually is threaded, but not in this case) which, when turned a partial turn, engages an internal dog into the groove running most of the length of the extendible shaft. Julius’ design was made in an effort to eliminate the stripping and breaking of set screws, which Erlandsen had previously relied upon in most of their previous tuning hammers. 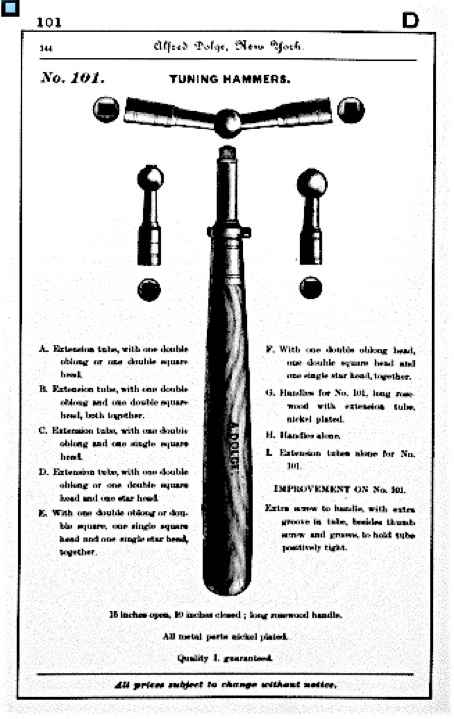 Julius Erlandsen’s 1904 double patent extension hammer. One very easy quarter twist of the thumbscrew clockwise locks the shaft down hard. 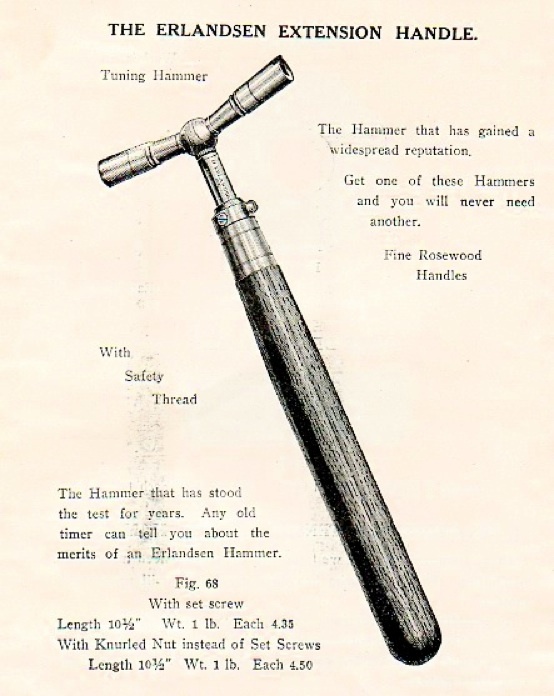 Side view of Erlandsen 1904 patent hammer. Julius Erlandsen was living in the Queens borough of New York City at the time of the 1940 census. He listed his vocation as a machinist, specifically making piano tools. Julius also declared that he worked a full 40 hour week previous to the census interview, and that he worked a full 52 weeks in 1939. Based on the limited volume of piano supplies produced during the Great Depression, I’d speculate that Julius was working alone or with one assistant. The last year of entry for Erlandsen’s 172 Centre St address was 1931. Julius likely was forced to downsize, and move essential equipment to his residence due to the loss of sales during the worst of the Great Depression. 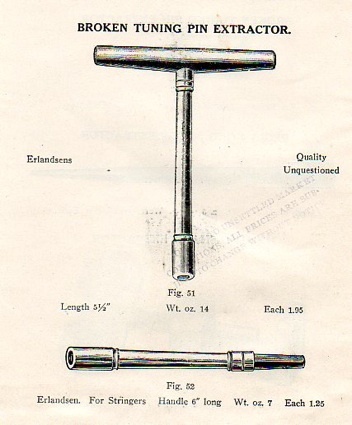 Most of Erlandsen’s 1930s tool production would have been for Hammacher Schlemmer. By this time, based on extant Erlandsen tools from the period, I believe that he was primarily producing tuning, voicing, regulating, and stringing tools. Mueller ‘improved, hammer, version 2, is one example of Julius’ late production. Plane and bow drill production had been greatly diminished if not curtailed during the 1930s. Erlandsen’s bow drill and tuning hammers were included in Goddard’s no. 80 trade list, circa 1938-9. Its the last offering of these tools that I have found. A Mueller ‘improved ‘ hammer, version 2, an example of Julius Erlandsen’s later production work during the 1930s. 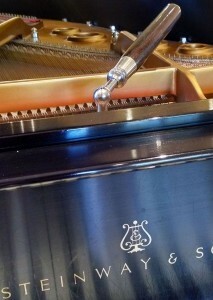 Photo was taken after I used it to tune this old Steinway “O” grand in a teacher’s studio. Julius Erlandsen’s obituary in the New York Times on Oct 24, 1956, just a few weeks away from his 90th birthday. He was born in December, 1866, according to the 1900 census.